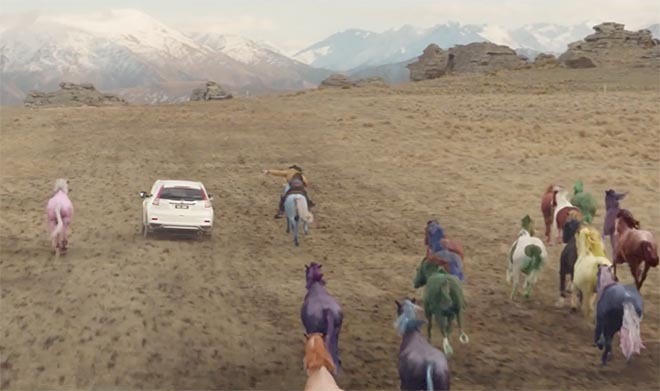 Honda Australia is promoting the new Honda CR-V Series II SUV with an advertising campaign featuring coloured wild horses. The campaign is centred around the imagination of a young girl who is determined to replace her broken pink toy horse. Her father plays along with her solution to the problem, only to discover it is more spectacular than he could have imagined. Featuring the song ‘Howlin’ For You’ by The Black Keys, the television commercial includes a special horse ranch and muster of a herd of horses with a difference. No matter where the road leads, the CR-V Series II is the SUV that’s made to ‘go with it’. The TVC is being supported with an integrated campaign that includes cinema, outdoor, online, social and dealer communications. The Honda Wild Horse Chase campaign was developed at Leo Burnett Australia, Melbourne, by executive creative director Jason Williams, creatives Joe Hill and Garret Fitzgerald, senior agency producer Cinnamon Darvall, group account director Chris Ivanov, senior account director Jaime Morgan, director of integrated strategy Ilona Janashvili, working with Honda Australia general manager sales and marketing Stephen Collis, brand communication manager Melissa Altarelli, specialist Sarah Holliday and coordinator Megan McDermott. Filming was shot by director Hamish Rothwell via Goodoil Films with director of photography Crighton Bone, executive producer Sam Long and production designer Guy Treadgold. Casting was handled at Catch Casting NZ and Mullinars, Sydney. Editor was Peter Sciberras at Method Studios. VFX supervision was by Colin Renshaw at Alt.VFX. Sound was designed at SoundLounge by sound engineer Sam Hopgood and producer Lizzie Haussegger.